North Korea’s nuclear defiance will feature prominently during the first day of a major security summit hosted by President Barack Obama in Washington Thursday. Obama will kick off the nuclear security summit by meeting Japanese Prime Minister Shinzo Abe and South Korean President Park Geun-Hye, followed by a separate sit-down with President Xi Jinping of China. 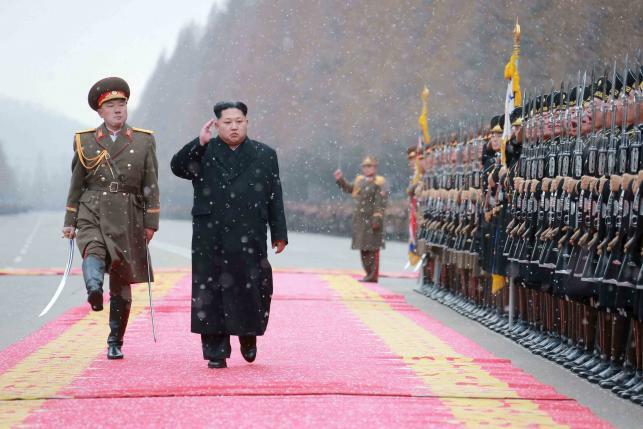 North Korea’s threats following the January detonation of a nuclear device and a long-range rocket launch a month later are expected to feature prominently in both meetings. “The international community must remain united in the face of North Korea’s continued provocations,” Obama wrote in an article published on the eve of the summit. Obama, Abe and Park are likely to call for the rigorous implementation of those sanctions and discuss the possible deployment of US missile defence systems in the region. The United States and South Korea have begun discussions on the deployment of THAAD — the Theatre High Altitude Area Defence System, a sophisticated missile system. “I think the three leaders will clearly demonstrate their unity in our commitment and our firm resolve to deter and defend against North Korean aggression,” said Dan Kritenbrink, a top Obama advisor on Asia. Obama will later meet Xi, his only fully-fledged bilateral meeting with the dozens of world leaders coming to Washington. Obama will also hold what the White House is calling a “brief” meeting with France’s President Francois Hollande. China is seen as key to making sanctions against North Korea bite. “We’ve seen China step up in many ways in terms of applying pressure,” said Obama foreign policy aide Ben Rhodes, praising the passage of UN sanctions. But Washington believes that China could more forcefully wield its influence over Pyongyang, including encouraging its Stalinist neighbour to tone down the destabilising rhetoric. China also has its own concerns about the deployment of THAAD so close to its own territory, fearing it may weaken Chinese capabilities and deepen US influence in the region. And Obama and Xi are also likely to touch on disputes in the South China Sea, where Beijing has seized contested territory. “This is where problems get solved and decisions get made,” said Kritenbrink. The spectre of the Islamic State group obtaining a “dirty bomb” will also loom over the summit, which is the fourth of its kind. The White House had seen the meetings as elevating the problem of shaky nuclear safeguards from the desks of technocrats to the highest corridors of power. The meeting comes just days after 32 people were killed and 340 were injured in bombings at Brussels airport and the Belgian capital’s metro. The attacks featured conventional explosives, but two of the suicide bombers — Ibrahim and Khalid El Bakraoui — have been linked to 10 hours of video surveillance detailing the comings and goings of a senior Belgian nuclear official. “Having a portion of the discussion that is focused on counter-ISIL is a decision that was made in January,” said Laura Holgate, the National Security Council’s senior director for weapons of mass destruction, terrorism and threat reduction. “But it turns out that it is obviously very timely, unfortunately. Such a device would not trigger a nuclear explosion but would scatter radioactive material — with potentially devastating physiological, medical and economic effects. Since the mid-1990s, almost 2,800 incidents of illicit trafficking, “unauthorised possession” or loss of nuclear materials have been recorded in an International Atomic Energy Agency database. More than fifty heads of state have been invited to attend the summit, but the absence of leaders from Russia, North Korea, Iran and Belarus virtually ensures gaps in the united front. Rhodes said Russia’s decision not to attend at the highest level was a missed opportunity for Moscow, which itself faces significant threats of its own. Obama also took a swing at Moscow, using his article to call for Russia to “comply fully with its obligations under the existing Intermediate-Range Nuclear Forces Treaty. “The United States and Russia – which together hold more than 90 percent of the world’s nuclear weapons – should negotiate to reduce our stockpiles further.